Many “Walking Dead” fans are saying that a new sneak peek at Season 7 teases the end for Daryl Dixon, a fan-favorite character played by Norman Reedus. In the clip, we see Dwight (Austin Amelio) making his way down the highway on a very familiar motorcycle while also wearing an even more familiar black leather vest with wings on the back. Some are speculating that the only way Daryl would give up two of his most precious possessions would be if he was dead. Could this mean that Daryl is the member of the group who met the end of Negan’s bat last season? Fans have been eagerly — or angrily — awaiting for the series to reveal which character got killed by Negan at the conclusion of Season 6. Reedus previously teased what impact (pardon the pun) Negan was going to have on the world of the show in an interview earlier this month. “Our whole world has been turned upside down, and that group of people have been fighting to have their feet firmly on the ground and have some sort of direction to live in and some sort of code to live by and moral compass, and they thought they were doing it okay, you know?” Reedus said. 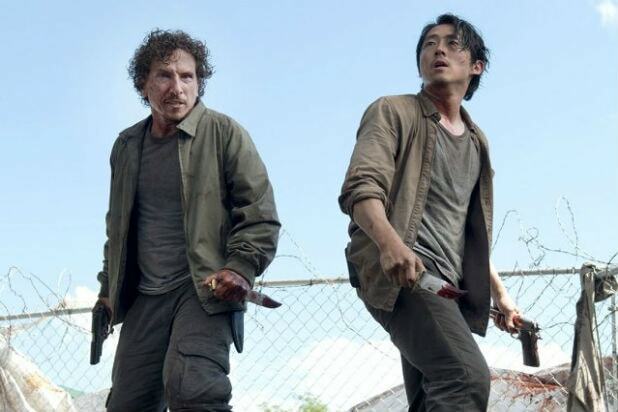 Of course, conventional “Walking Dead” fan wisdom says that if Daryl dies, we riot. “The Walking Dead” returns on Oct. 23 on AMC.